Blepharitis Treatment At Home – What To Use? Inflammation of the eyelash follicles, or blepharitis, causes crusty, red and swollen eyelids. Blepharitis symptoms can also include itching and burning eyes. While medical care is usually best recommended route for this condition, there are things that your doctor might recommend be used for blepharitis treatment at home. 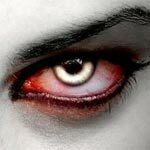 Are you looking for bloodshot eyes treatment that is natural? First you should know that if you have blood shot eyes because of injury or if you are having eye pain, you need to see a health professional as soon as possible. Fortunately, the majority of cases of blood shot eyes aren’t that serious. 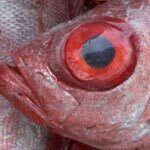 Bloodshot eyes symptoms include both redness of the entire white part of the eye and bright red splotches. 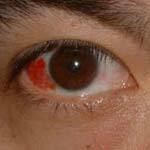 Bright red splotches mean that you have a subconjunctival hemorrhage. You wake up in the morning, look in the mirror and discover that there is a bright red splotch on one eye! 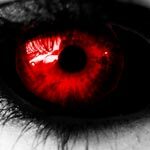 You scurry to find an ophthalmologist (the type of eye doctor that treats diseases of the eye), go for a check-up, and are diagnosed with a subconjunctival hemorrhage! The diagnosis sounds worse than your eye looks. If you have a subconjunctival hemorrhage, you have a popped blood vessel in eye. These are very small blood vessels. Popped blood vessel in eye is a harmless medical condition caused by small blood leakage from a ruptured blood vessel underneath the sclera or the white part of the eye. Popped blood vessel might look worse than it really is, covering just a part of the sclera or spread out across the whole surface of the eye. Trapped blood underneath the surface of the sclera can not be easily evacuated and will take anywhere from 10 to 14 days to be dissolved.